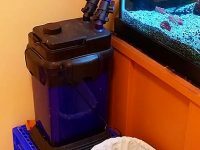 This article reviews the best aquarium filters that are rated for large fish tanks from 100 to 125 gallons. There are 6 filters from 3 different types: 1 trickle, 1 Hang-On-Back, and 4 canister filters. 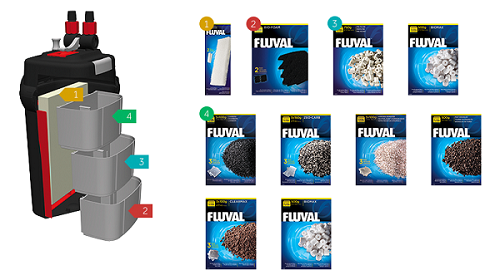 Fluval is a reputable brand in the world of aquarium pet lovers thanks to the quality of the aquarium filters they make. 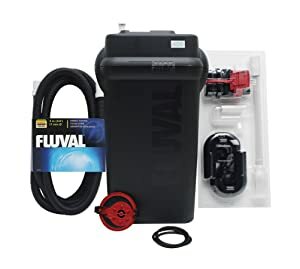 The Fluval 406 canister filter features a very large filtration capacity making it the best option to keep your 100 gallon fish tank clean for a long period. The filter comes with four large media baskets for you to put any filter media into. The mechanical filtration stage is achieved through vertical large foam pads to capture more debris, prevent clogging and reduce maintenance. The design also makes it quick to maintain the mechanical media without having to remove media baskets. Despite not being the quietest canister filter, the Fluval 406 operates quietly with its sound dampening impeller design. The impeller is also designed to last a long lifetime. Besides the good impeller, other parts of this filter are made of high-quality materials making the entire unit very durable. Some hobbyists reported that their Fluval 406 canister filters can last for over five years without any problems. What I love best about this model is its design for easy setup and maintenance. 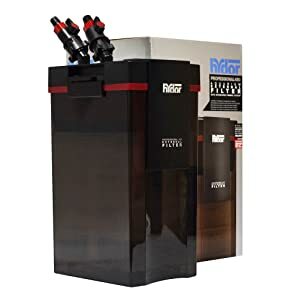 The filter features AquaStop valves designed to stop the flow of water without requiring you to disconnect the hoses, thus eliminating leaks and messes during maintenance. It also features lift-lock clamps which rapidly and securely lock the lid in place for easily assembling the filter after cleaning. The instant-prime feature eliminates the need of manual siphoning to get the filter started. 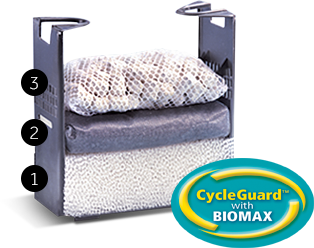 Filter media: AquaClear Foam, Activated Carbon, BioMax and Cycle Guard. 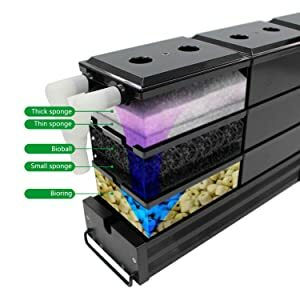 If you are finding a versatile hang-on-back filter for your 100 gallon aquarium, the AquaClear 110 power filter is the best option. The filter boasts of its very large filter capacity that is 7 times as much as that of comparable models. This means it can accommodate a huge amount of filter media for better filtration and impressive water quality. The large filter chamber also allows you to use any filter media you want. It comes armed with a large foam pad, a bag of BioMax ceramic rings and an activated carbon bag. These filter materials are included in a patented re-filtration system (Cycle Guard) from Hagen Fluval that offers many helpful features. Thanks to the Cycle Guard, the flow rate of the filter can be adjusted but not affect its filtration efficiency. Moreover, this system also enhances the filtration efficiency by expanding the contact time between the filter media and the water. 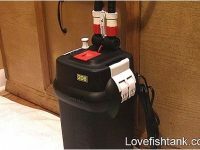 As with most hang-on aquarium filters, the AquaClear power filter is very easy and quick to install. You need no tools and experience to install it correctly as long as you can follow the instructions on the user manual. 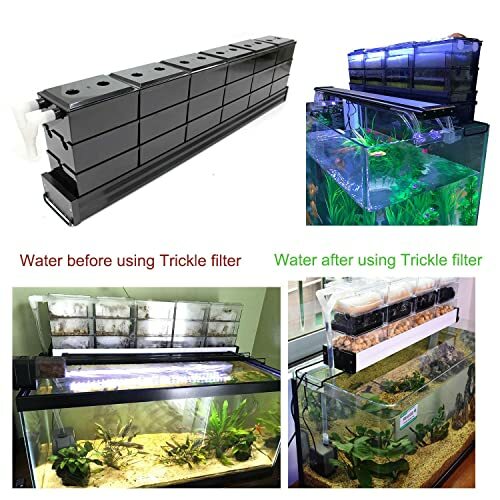 If you are finding a large filtration system for your 100 gallon fish tank or turtle tank, this trickle box filter is one of the best choices. It features a brand new design to optimize biological filtration function and achieve clean and clear water for your aquarium. The way how this trickle filter works is very easy to understand. 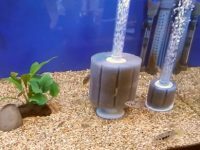 It is powered by a water pump (buy separately) which pulls the water from the aquarium into the rain pipes of the filter. These rain pipes trickle the strong water flow from the pump into a lot of smaller ones that then go through the filter boxes containing filter media for filtering. The double rain pipe design helps to avoid spillover regardless of the power of the pump. The ideal pump to use with the filter should have a flow rate of 740-1100 gallons per hour. 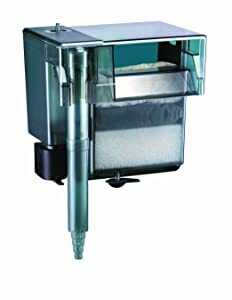 The product comes with 18 large filter boxes that are sorted into three layers and are great places for accommodating a huge amount of filter media. Each box is pre-drilled with a lot of hoses which allow the water to go through. Thanks to this mechanism, the water is enriched with oxygen before it flows through biological filter media, which promotes the activities of friendly aerobic bacteria for better biological filtration. The oxygen-rich water is also good for the healthy growth of your fish. The product doesn’t come with filter media; however, you can buy and use your own ones. The boxes in the top layer of the filter is a great place to put mechanical filter media such as foams, Japanese filter mat, pre-filter media… These materials will trap and segregate particulate matter for manual removal. The boxes in the middle and the bottom layers provide abundant spaces for biological and chemical filter media. You can put bio-foams, ceramic rings, bio-balls, activated carbon… in these boxes to perform the most efficient biological and chemical filtration that keep the water clean and healthy for your fish. 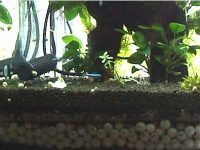 Filter media: bio-sponges, bio-floss, activated carbon. The Penn Plax Cascade canister filter is a very popular choice because of its very affordable price and quality. 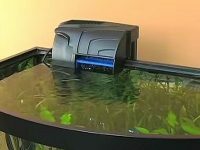 It provides a maximum flow rate of 350 gallons per hour and is rated for up to 100 gallon aquariums, both fresh and salt-water. It also features flow-rate control valves for easy adjustment to fit different use purposes. 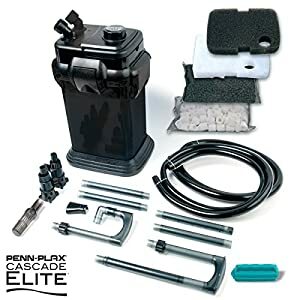 The Cascade 1000 is easy to install since it comes with all necessary accessories to connect to your tank. The setup process will take only about 30 minutes and the filtration process delivers incredible performance in less than a day. It is fitted with a quick-push primer for hassle-free setup. The two independent directional full degree rotational valve guarantees worry-free placement. The unit comes with start-up filter media, large filter trays, and input/output tubing. The trays are large to allow for containing more filter media, hence better filtration. When the installation is completed, the filter delivers incredible chemical, mechanical and biological filtration for crystal clear and healthy water. Filter media: cotton pads, bio-balls, ceramic rings, activated carbon bag. 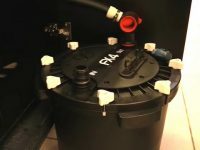 The Pingkay canister filter is an affordable and cheap option you can buy for your 100-125 gallon aquarium. The built-in pump is capable of achieving a maximum flow rate of 575 gallons per hour (approx 2000 liter per hour) that will ensure the water are constantly circulated and cleaned. It features an advanced filtration technology that eliminates all biological, mechanical and chemical impurities from your fish aquarium. Its built-in 9-Watt UV sterilizer is great in killing spores of algae and offending bacteria, viruses, and parasites. The canister filter offers 5 stages of filtration with its 4 media baskets and a UV stage. The filter media baskets provide for easy use since you can fill them separately. These trays also feature practical handles to make handling easy and without messes. 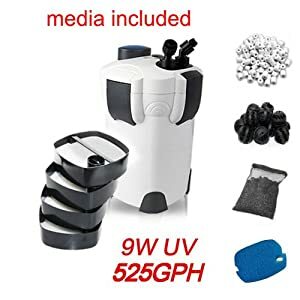 You will also love the quick-disconnect coupling on the cover lid (top surface) which allows you to easily remove the hoses from the canister filter without having to empty it for faster and leak-free maintenance. The canister filter comes with the complete kit allowing you to use it right out of the box. To ensure the filter is leak-proof, the manufacturer subjects each unit to pressurized test. Filter media: large-spore sponge, filter wool, porous cylinders. The Hydro Professional 450 external canister filter is one of the quietest canister filters currently on the market. It is fitted with a powerful pump with a maximum flow rate of 320 gallons per hour and ideal for a 100-125 gallon fish tank. The filter comes with everything you need for the setup, even different types of filter media. The filter is optimized to effectively provide mechanical, biological and chemical filtration that any aquariums require for a healthy and long-lasting aquatic experience. The manufacturer describes this product as a complete ecosystem in a box. The easy priming feature makes the use and maintenance of this filtration machine extremely easy.